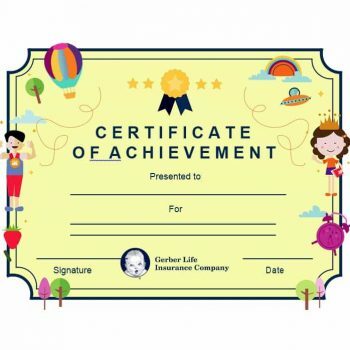 Certificates of Achievements are awards given out by employers or schools in order to give recognition to an accomplishment made by a particular person. 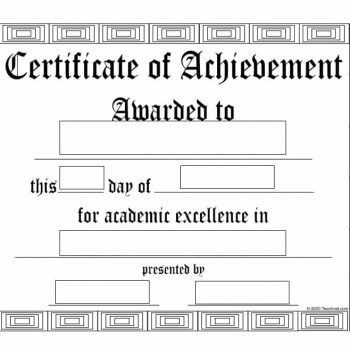 They are given for the purpose of acknowledging the fact that a student, employee or member of a group or organization has done outstandingly well in a particular task or that the person has finished a subject or course in an academic setting with top ranks. 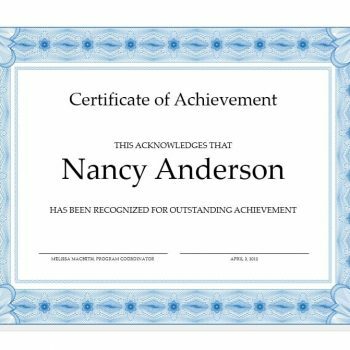 An Achievement Certificate is a formal document which can be placed into the school records of students as proof of their accomplishments. 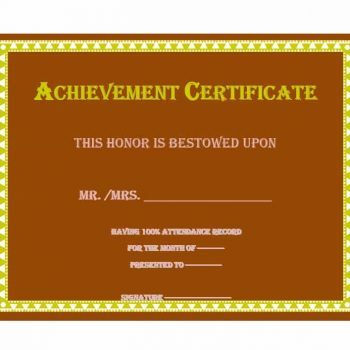 Some schools might require these certificates as proof of achievement during enrollment. It can also be used as an additional or supplementary document in a resume to add substance to it when searching for employment. 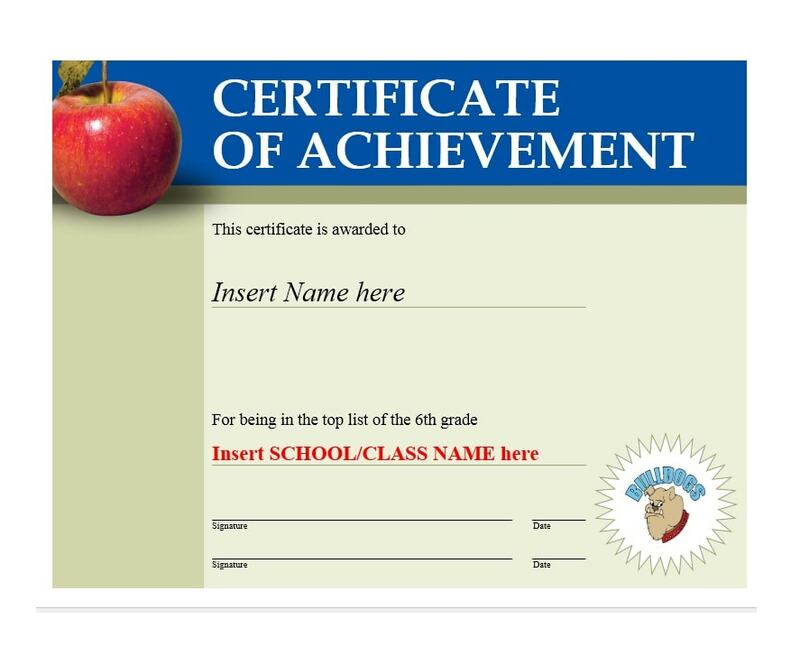 When adding certifications to your resume, you are supposed to ensure that you have the actual document to back up your claims of achievements. 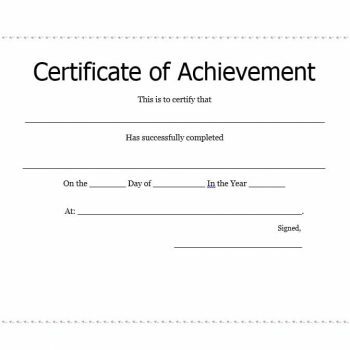 This article will provide you with all the necessary information you need about the certificate of achievements so that you can start making your own for your school, business or organization. 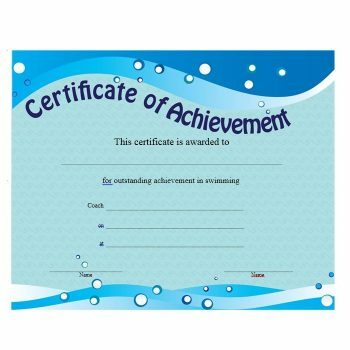 Simple as they may seem to be, there are different kinds of Achievement Certificates. It would be helpful to learn about the different types and when they are most frequently used. 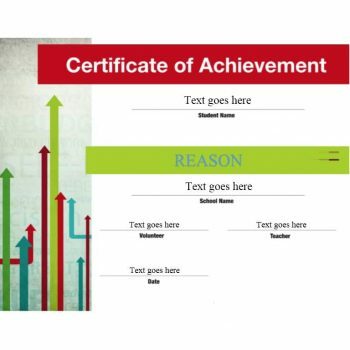 In knowing these, you would be able to make the perfect Certificate of Achievement Template which would suit your needs. During all the years of primary and secondary school, students are competing in academic and non-academic contests and competitions. 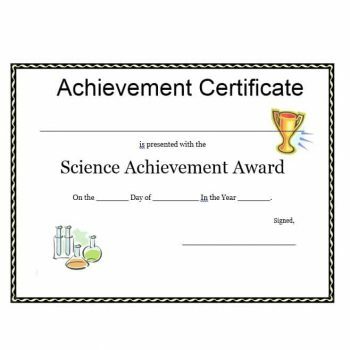 Whether it’s an achievement in art, sports or other non-academic competitions, the student winner is given an Accomplishment Certificate. 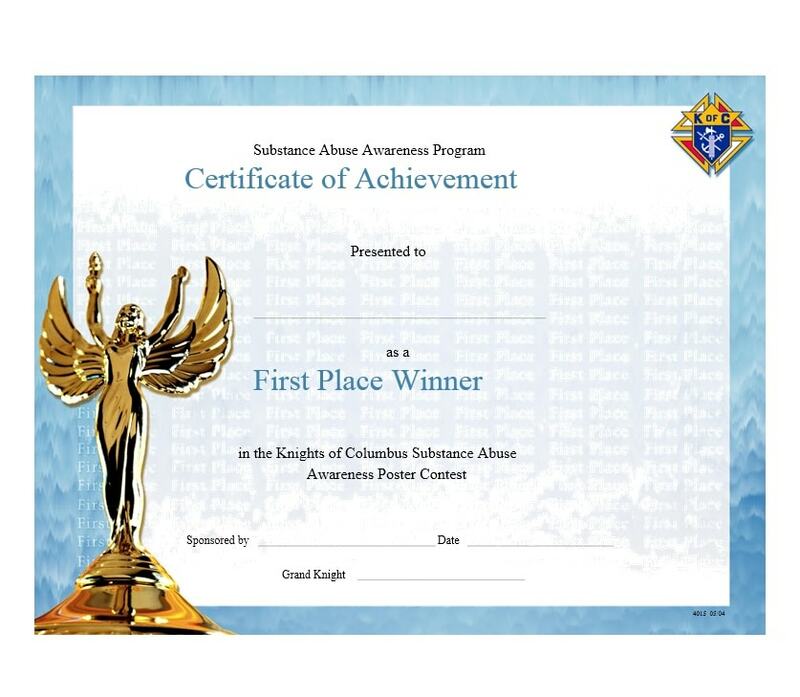 Winners of academic contests – such as spelling bees, school-wide quizzes and the like, are also given this document as a prize for being victorious. 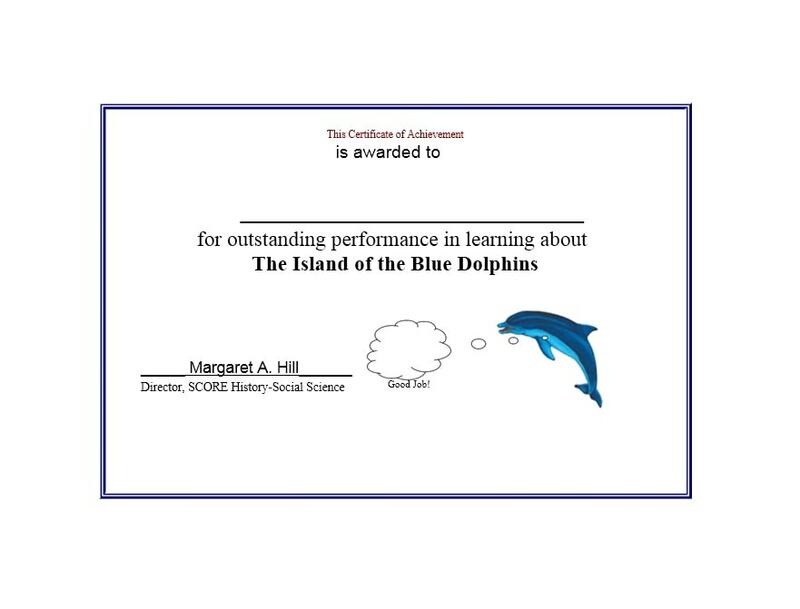 Students with honors or those who have the highest academic ratings, grades or scores can also be awarded with this credential. 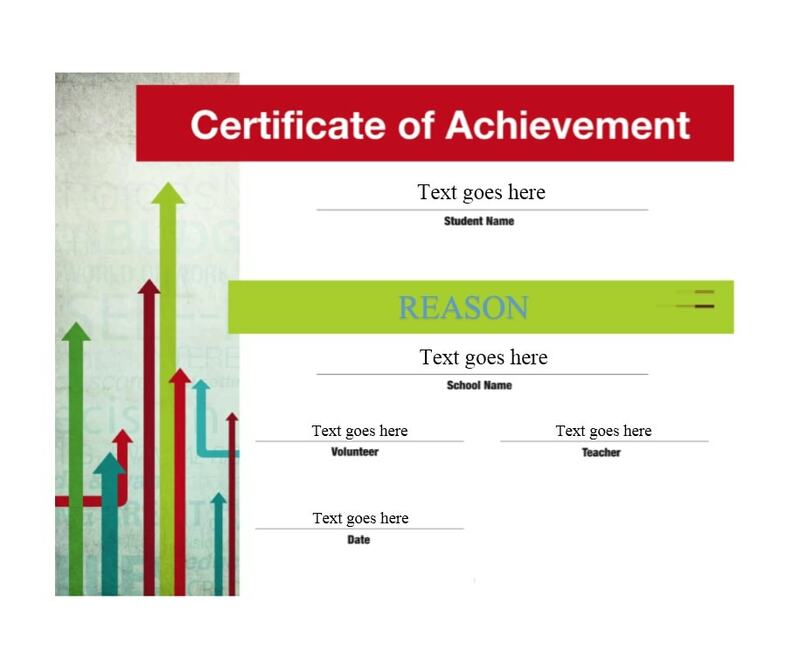 Completion of primary studies and secondary studies can also be the reason for students to get such a certificate. Some colleges give students opportunities to take study courses which usually run for a couple of semesters, focusing on one particular subject like human resources training or medical assistant training. 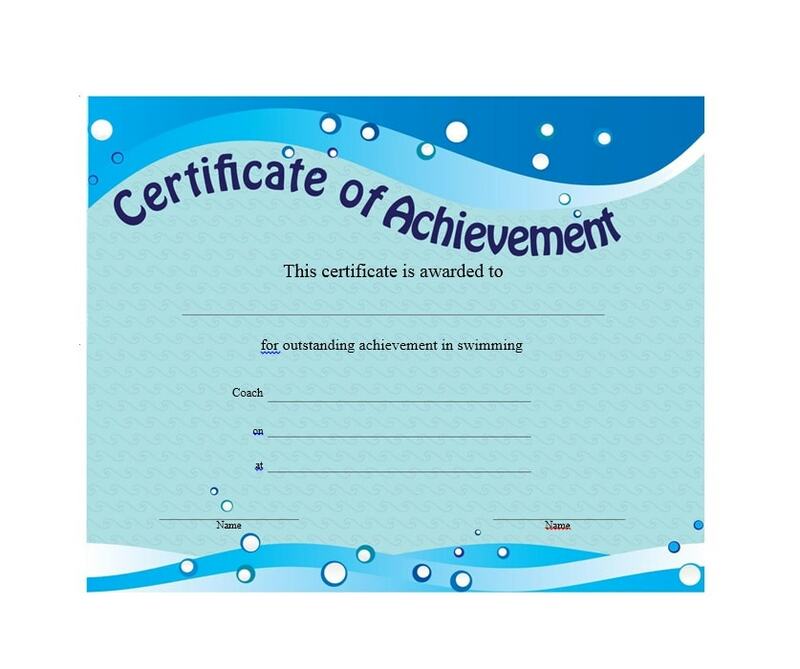 If a student is able to successfully complete this course, he/she is awarded a Certificate of Achievement. 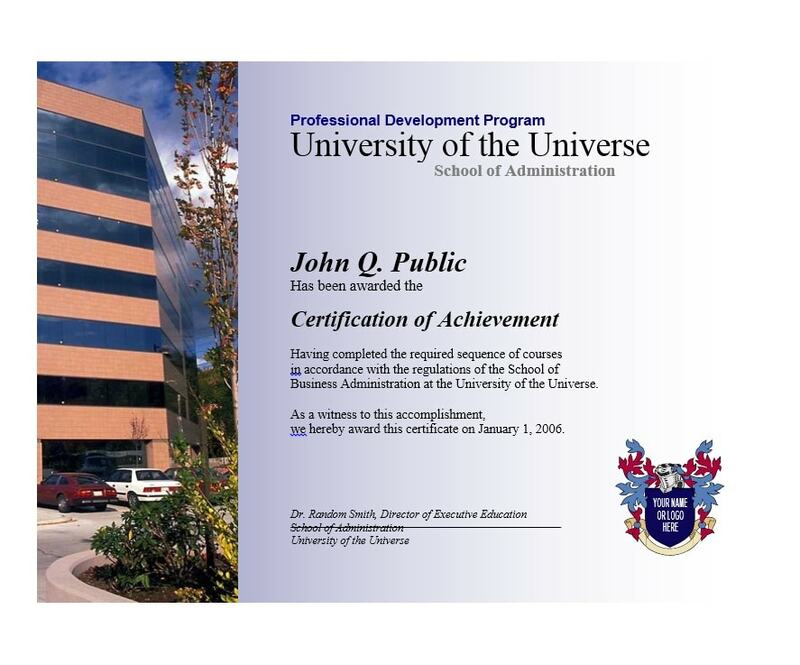 Colleges may also offer graduate-level or entry level position training for the students and completion will also allow for an Achievement Certificate. 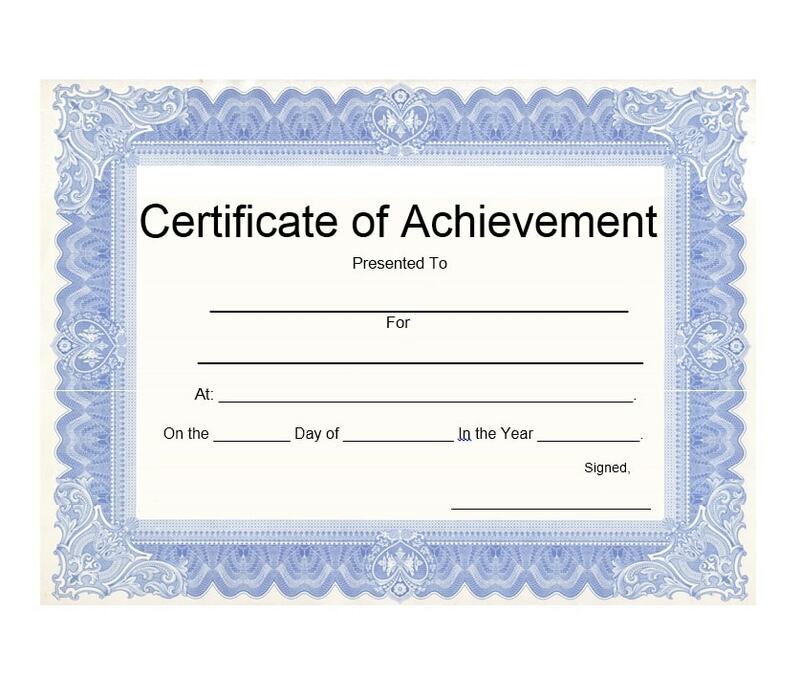 Some companies offer chances for their employees to get Achievement Certificates by participating in inter-office competitions. 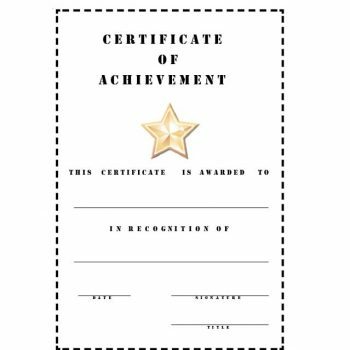 Employees of different ranks can also receive a certificate for performing excellently in their job during a specific period of time. 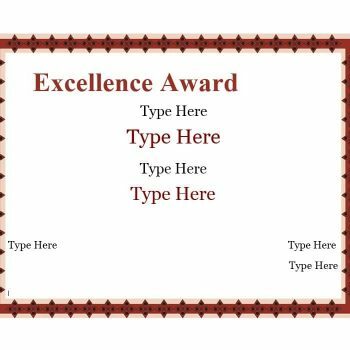 Some examples of these would be “Best Supervisor,” “Employee of the Month,” and other such titles. These could serve as incentives for employees to encourage them to be more productive and do their jobs better. 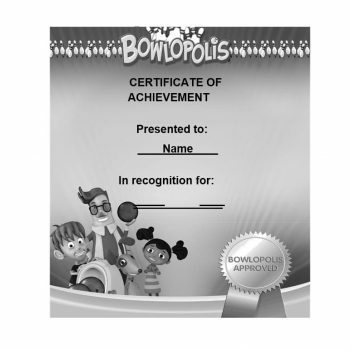 In sports competitions, winners can be awarded an Achievement Certificate along with other prizes such as trophies, monetary rewards or other such gifts. 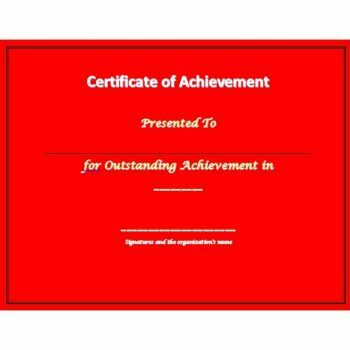 There are times when a whole company or organization receives an Achievement Certificate. 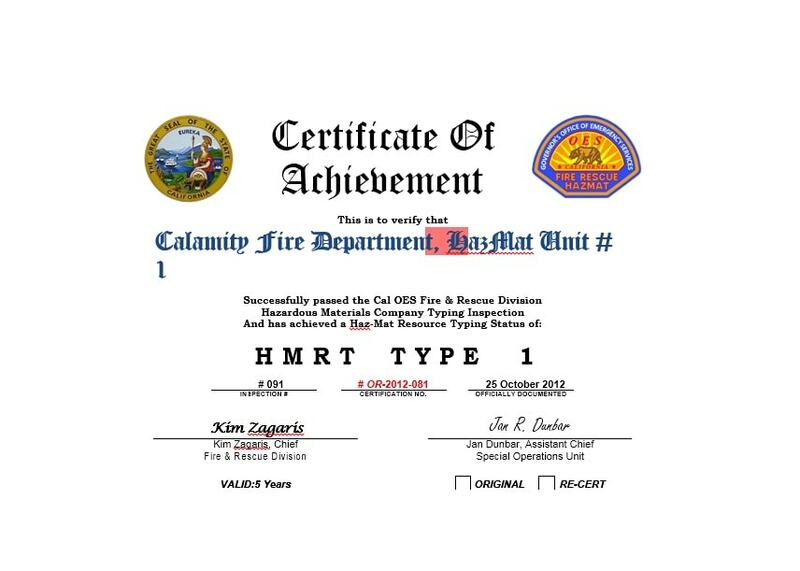 There are instances where the company or the organization has the best overall performance or the best and most highly rated product/s in the country would call for a certification to prove this accomplishment. 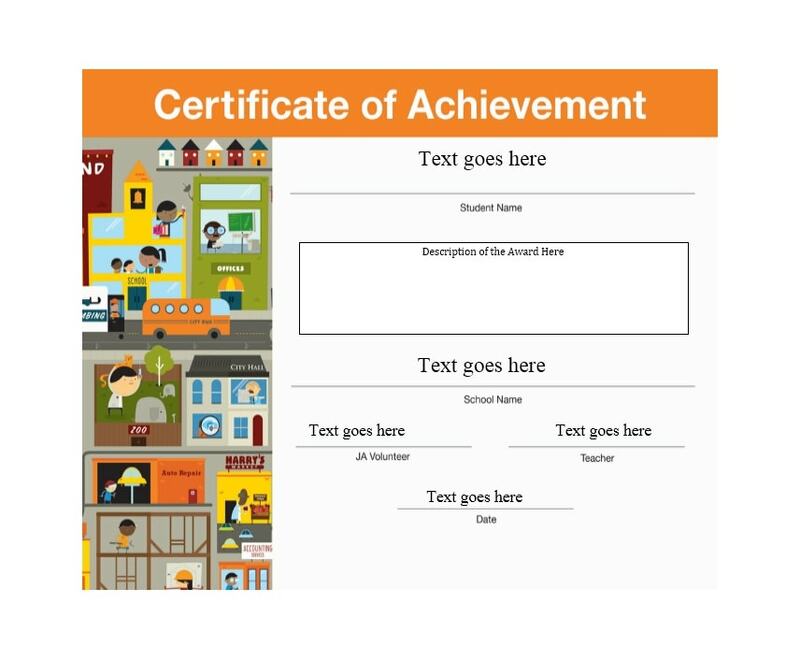 Achievement Certificates have lots of benefits, both for those who give them and for those who receive them. Learning these benefits will give you more understanding on why they are made and why they are given. 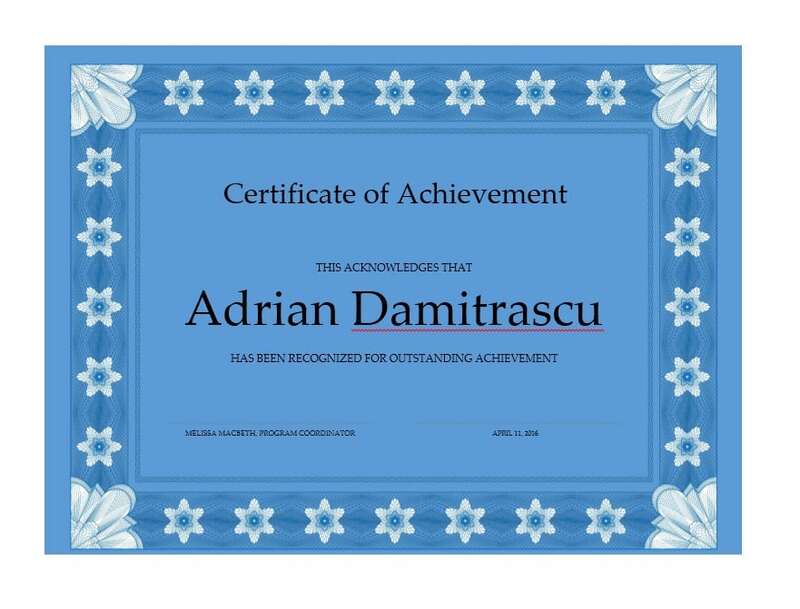 They encourage productivity and excellence. In educational and professional settings, giving these kinds of incentives can help employees and students become more productive and more eager to work or study. In the educational setting, students generally have more enthusiasm to try their best in their studies. 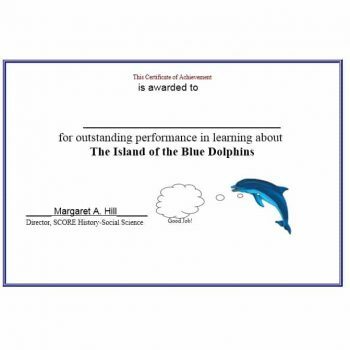 Getting the chance to acquire a certificate for their efforts may help them in being more energized to hone their skills or master their subjects. 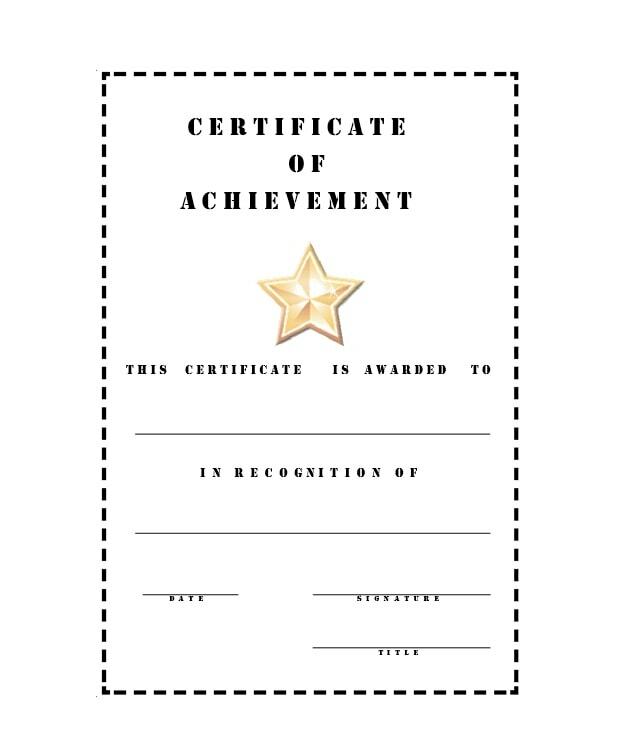 In the professional setting, since achievement awards usually come with other benefits, employees are more inclined to increase their productivity and do their best in their work. 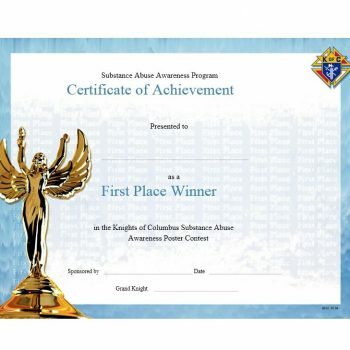 They assist in improving confidence and self-esteem. 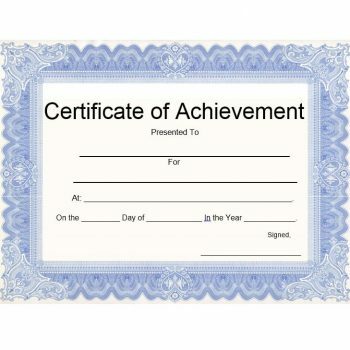 People who receive Certificates of Achievement tend to gain confidence in their abilities. Their self-esteem gets a boost and they also gain an appreciation for putting in the best efforts in accomplishing tasks. 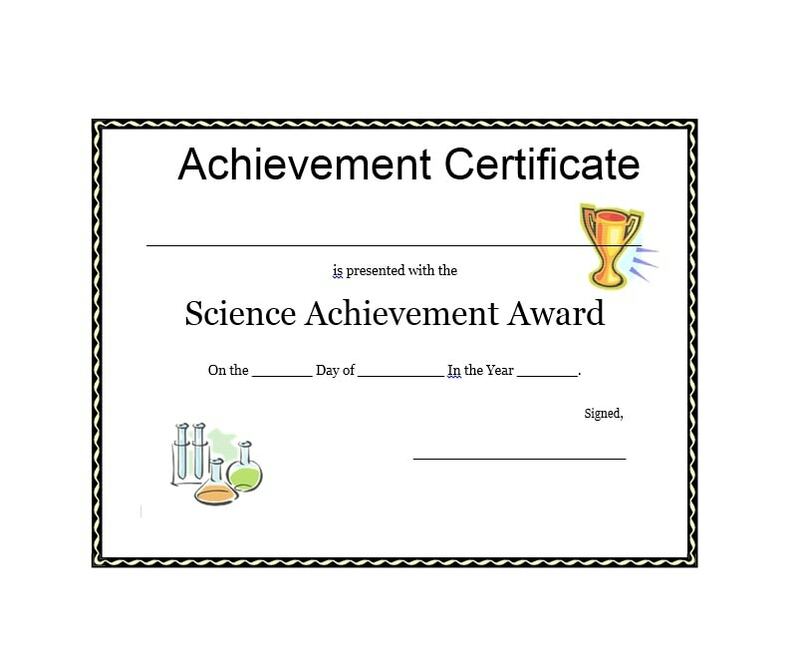 They provide concrete proof of one’s accomplishments. 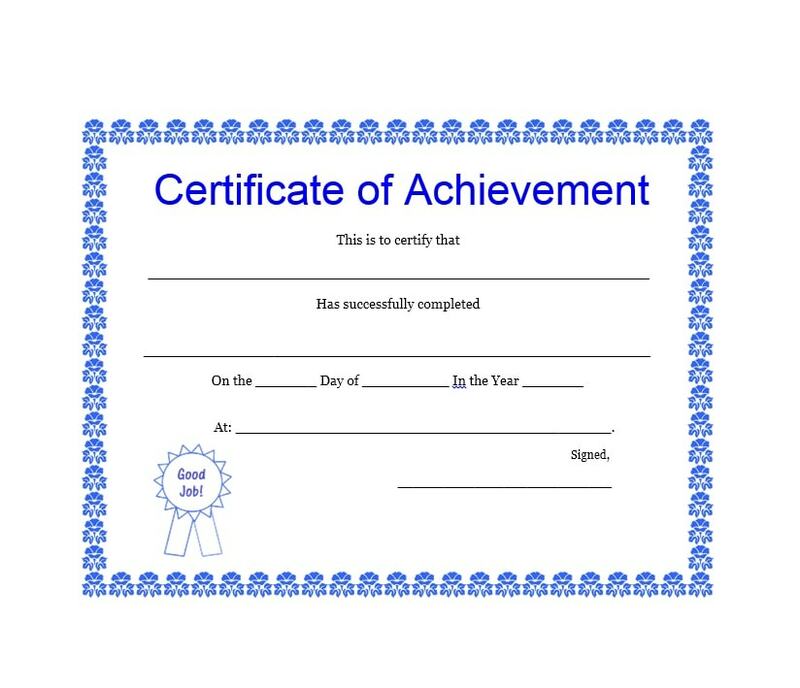 Having a document to validate one’s achievement is important for various reasons. 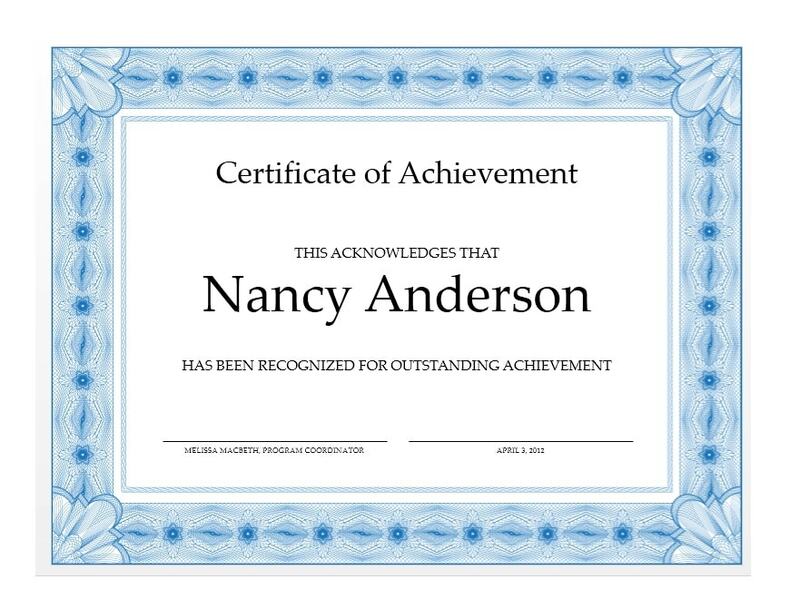 To show to potential employers, to show friends and loved ones and even to display in one’s home or office as evidence of success in one’s life. They help in nurturing staff and employees in an organization. The act of recognizing the efforts of employees and staff in a company or organization gives the workers drive to do better. It also gives the impression that the company actually notices what the employees do and is willing to give proper compensation to those who go beyond what is expected. 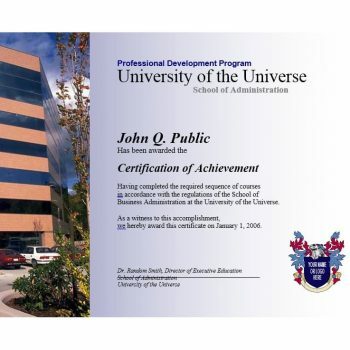 Certificates of Achievement are used as Tax Benefits for companies and organizations. 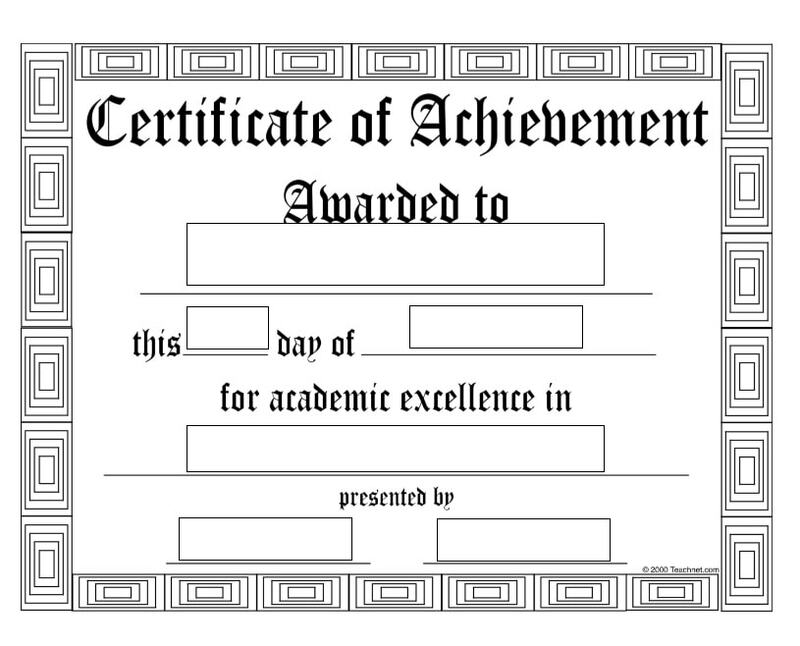 Usually, Achievement Certificates are accompanied with monetary compensations or compensations in kind. When a company does this, it can deduct the amount awarded to the employee given as cash or kind, from their taxes. 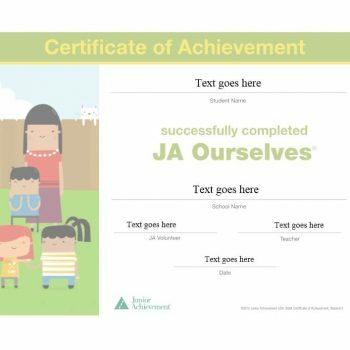 As you can see, these certificates come with a lot of benefits – both for provider and recipient as well. 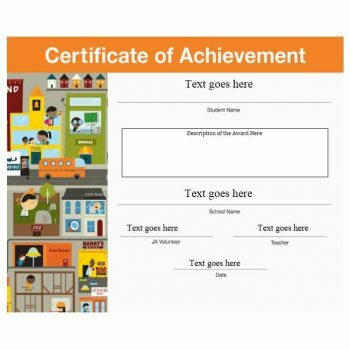 Now that you know how important it is to give this document to people who are deserving of them, it would also be very helpful to learn how to make your own Certificate of Achievement Template. 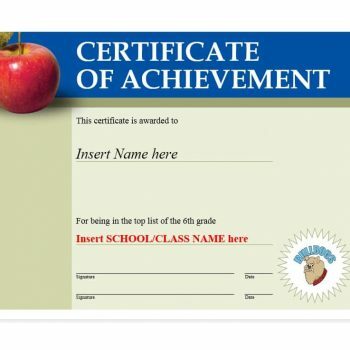 Actually, Achievement Certificates do not have any formal requirements needed to create the required templates. You may design your own template and use your own wordings. 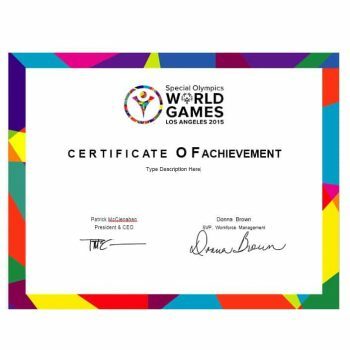 The most important thing to keep in mind is that these certificates have seven important sections which must be present in order for it to be official. Knowing these sections will help you in making a well-organized template. 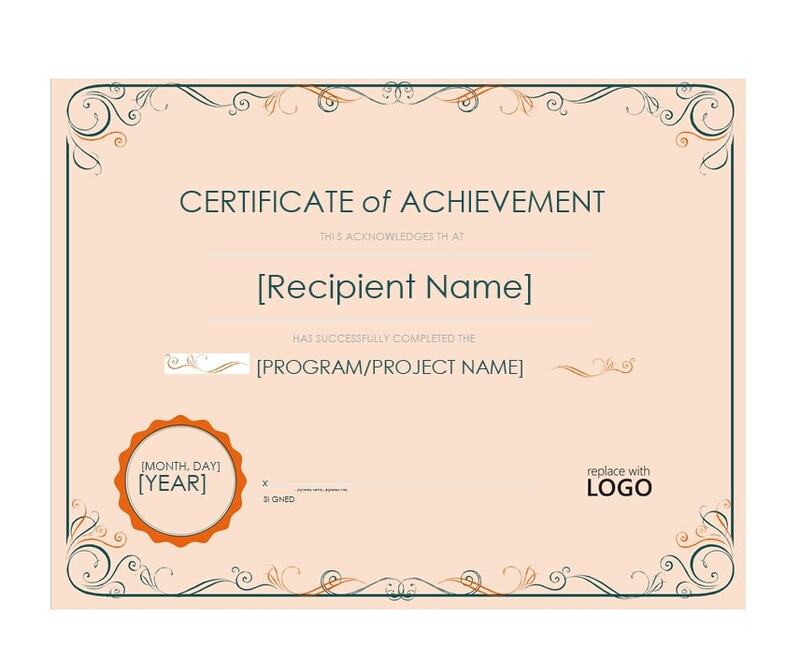 Having one in your school, company or organization would be very helpful so that whenever you need to award one, all you have to do is to edit the information on it – such as the names, dates and the achievements achieved by you, print it out and award it! 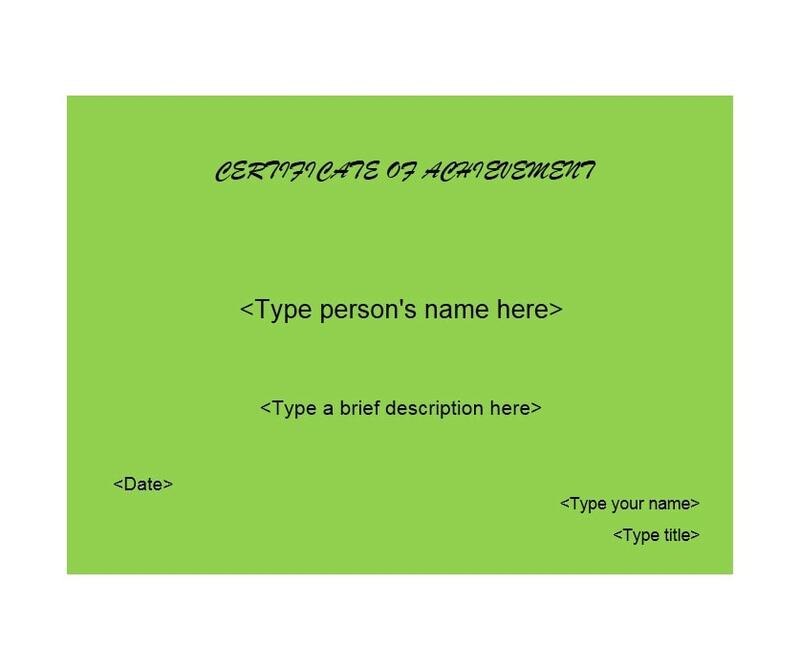 This is the second most important part of the certificate and it is found at the top, usually with a bigger font than all the rest of the information.You can also use different colors and formatting on the text when making the title line. It can be curved, straight, bold or with a shadow. It all depends on how you would like to present it. 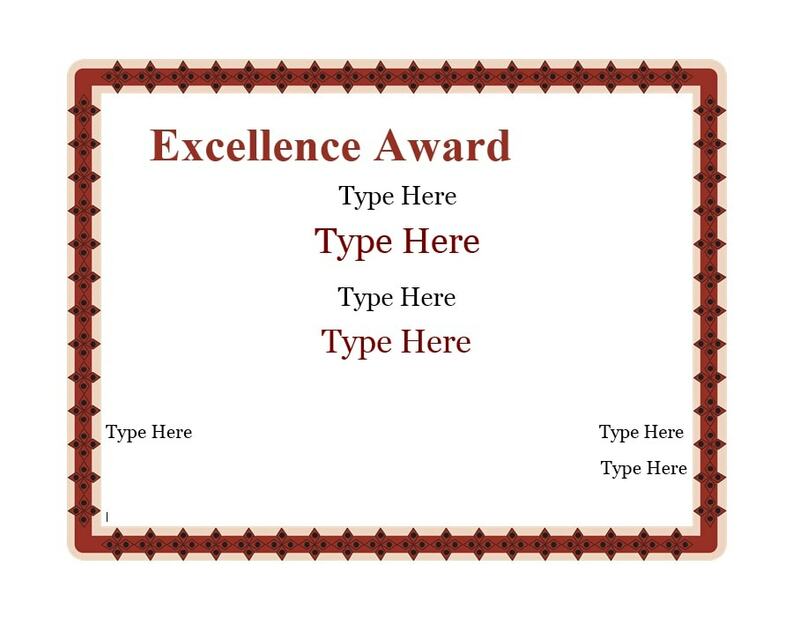 Just make sure that the text is centered for it to look official.Here, you can use words like: Achievement Certificate, Certificate of Achievement, Achievement Award or other wordings which you think would fit the most. This line of text comes directly below the title and it can be worded in different ways. 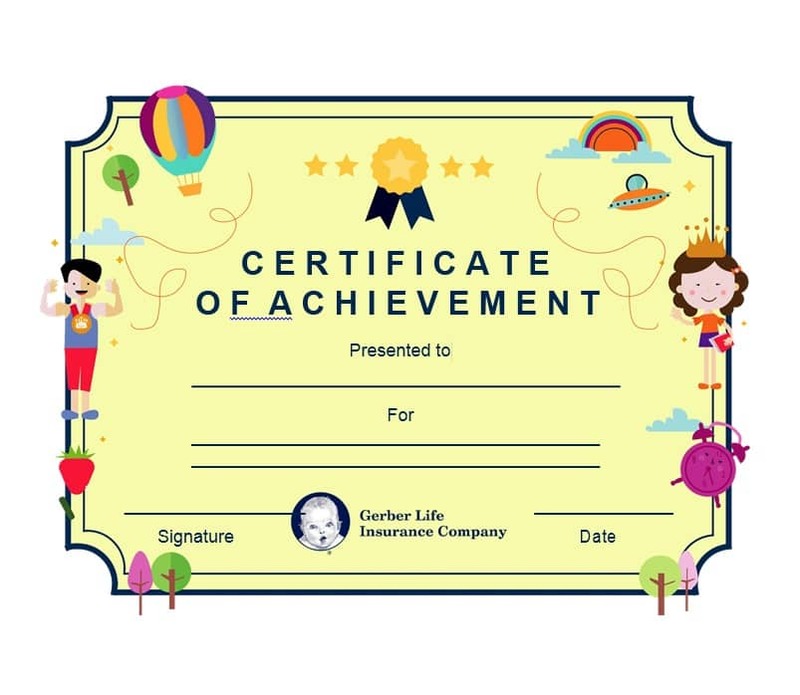 Some of those ways can be: This certificate is awarded (or hereby awarded) toThis certificate is presented (or given) toThis certificate is hereby bestowed (or bequeathed) uponThis line of text is a lot smaller than the title and the name of the recipient. 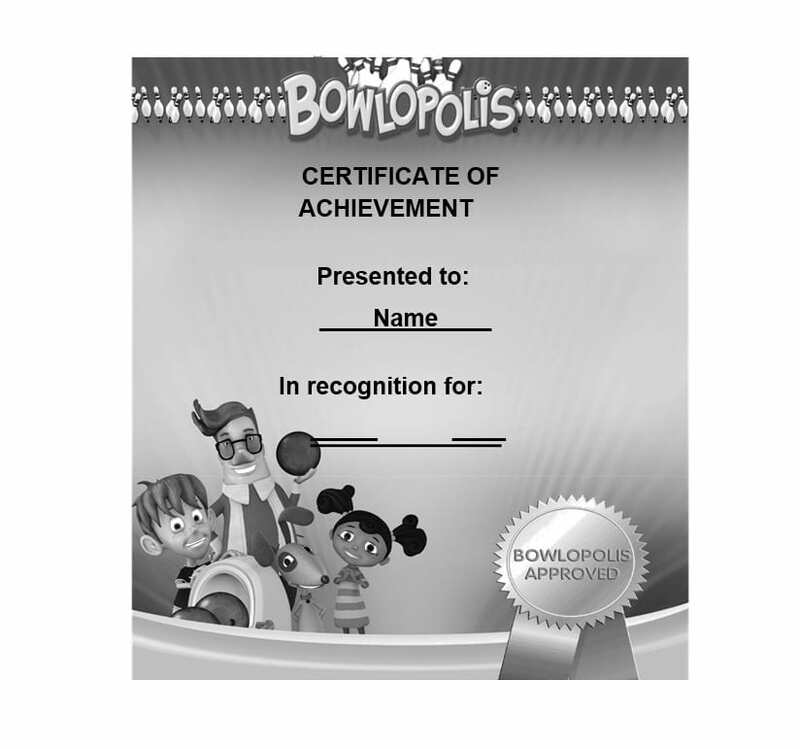 This is the most important part of your certificate. 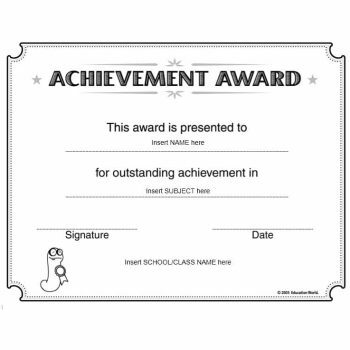 No matter who you are giving the award to, make sure that you spell their names right! 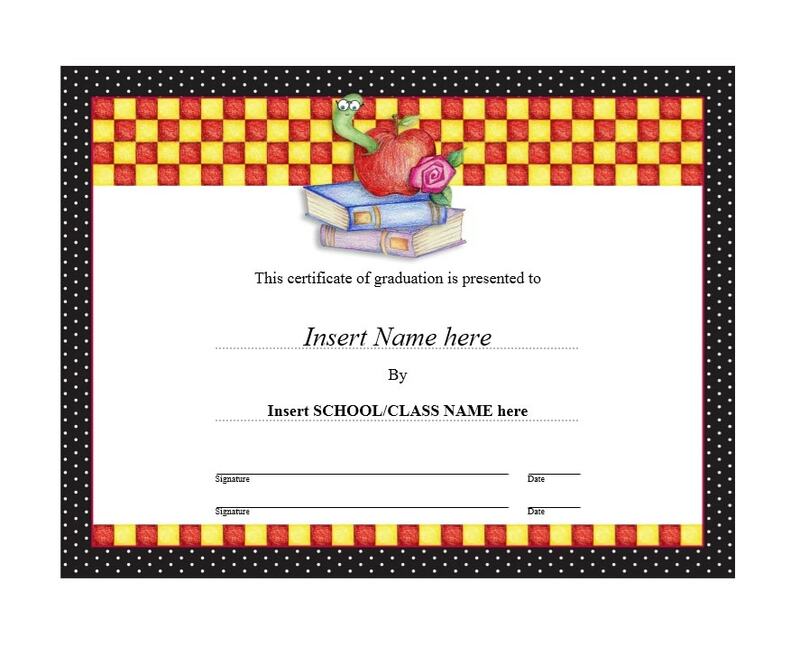 You may fill in this part with the names of an individual or the name of a group or organization which the document will be given to or awarded to.This text can be as big as or bigger than the title to emphasize the names of the recipient. 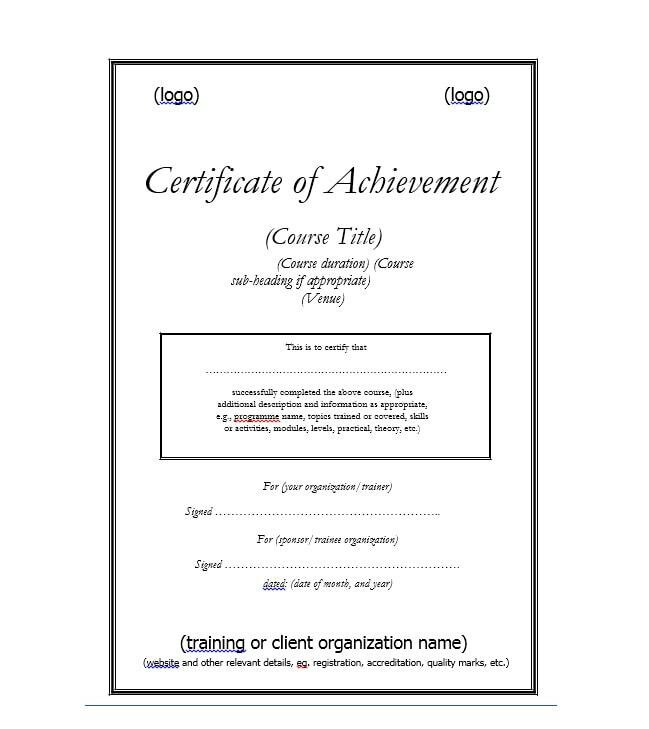 You may use any font, as long as it goes hand-in-hand with the rest of the certificate. 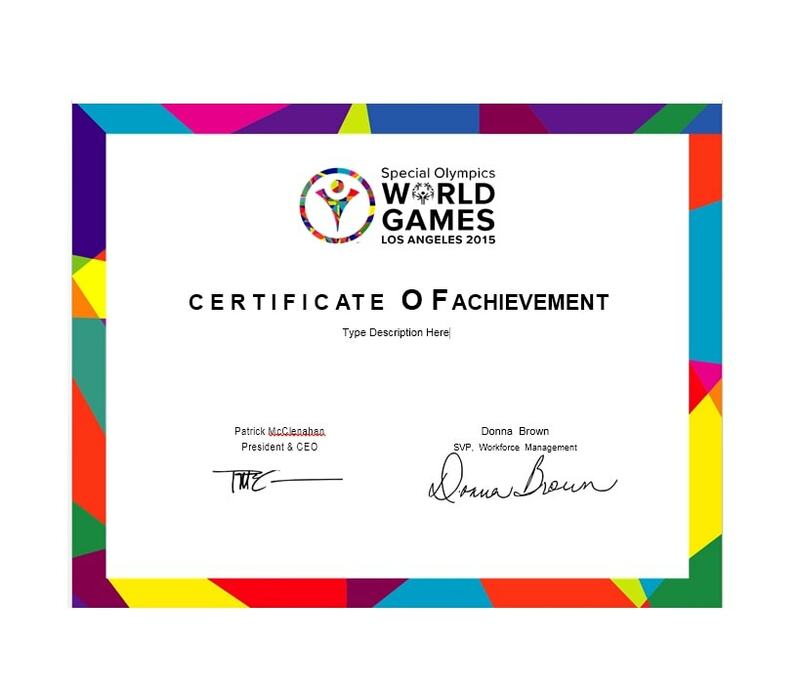 Playful fonts can go on school certificates and more formal fonts can be used for more professional ones. 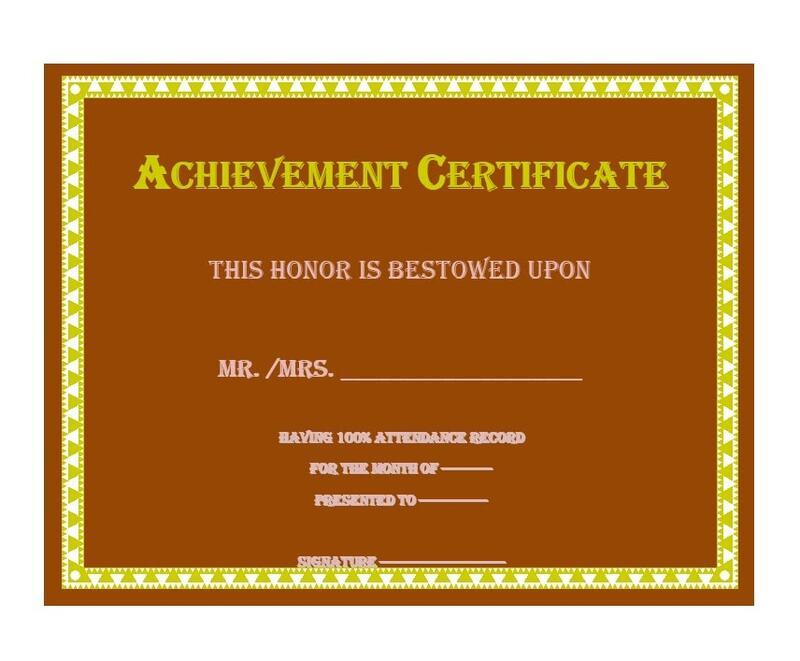 This line of text indicates who the certificate is from and it comes directly below the names of the recipient. The texts here do not require being large, as long as it can be read. 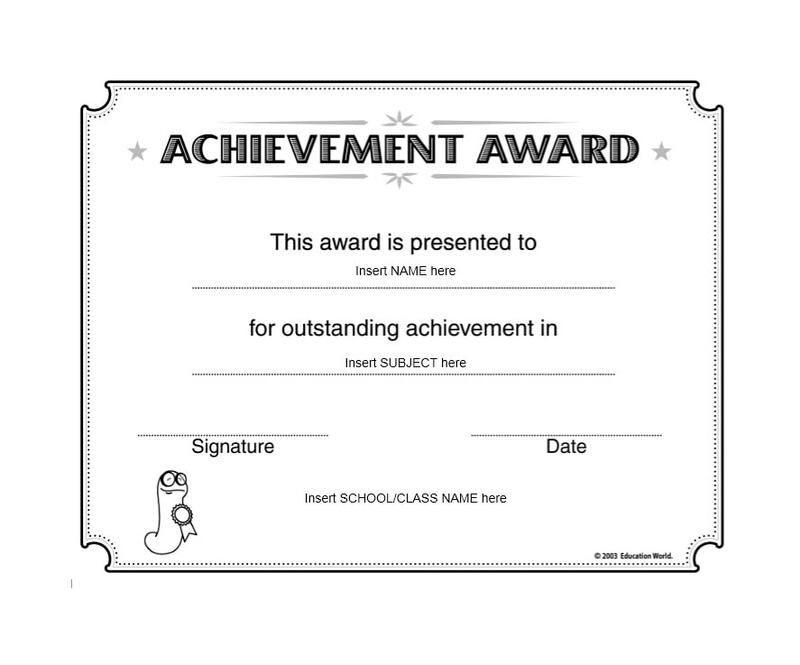 This text can be a paragraph narrating why the recipient received the Certificate of Achievement. 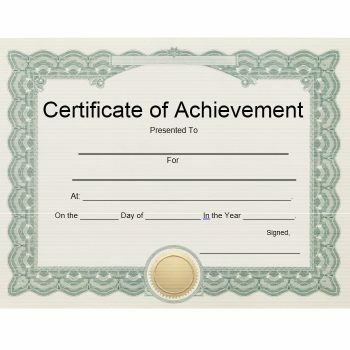 Since the certificate is for an accomplishment that was achieved, it would be good to describe the circumstances of the accomplishment. 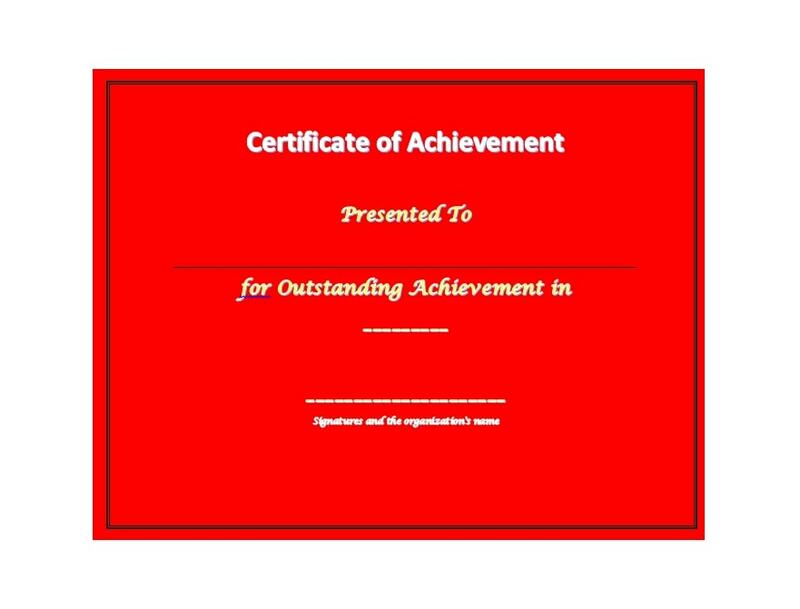 You may begin this paragraph with a phrase such as: In recognition (or achievement) ofFor outstanding (or excellent) achievement inOr whatever similar wordings you may think of. 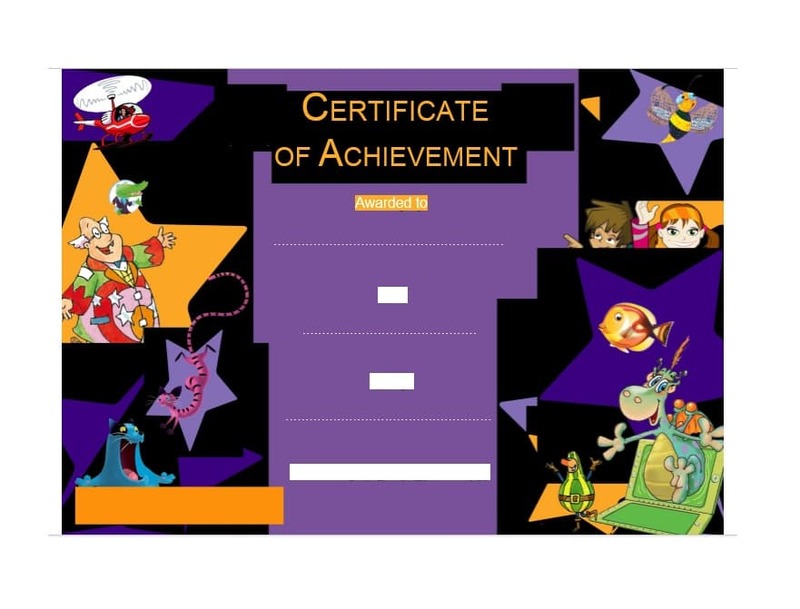 Then you can continue with the narration or description of the achievement. 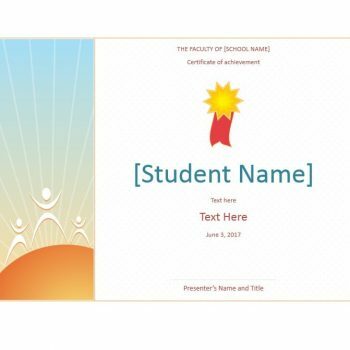 This text is usually a bit bigger than the presentation line and from text but it should not be the same size or bigger than the title or the names of the recipient. It would also be advisable to use a “common” font for this text te it more readable. Finally, make sure to center this text so that it looks neat and official. 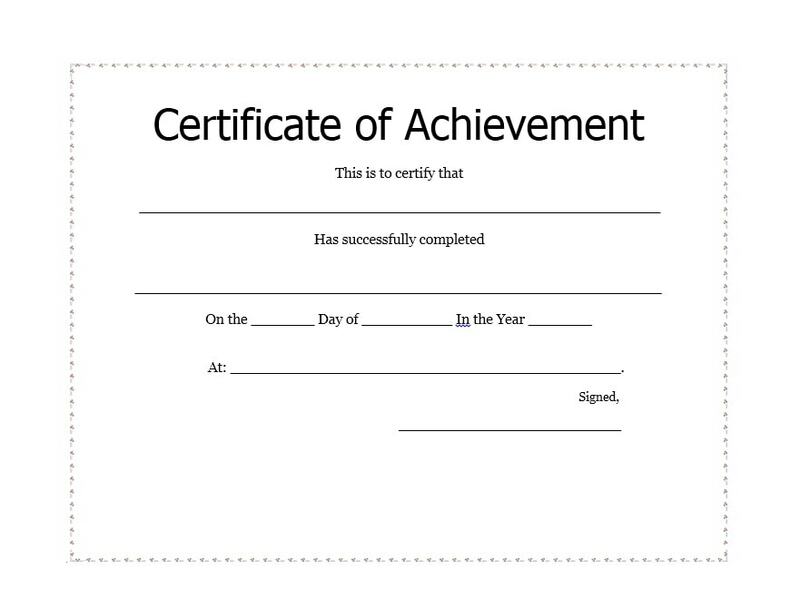 You can either place the date when the certificate was been or will be awarded or the date when achievement was done. In placing the date, you can use a variety of formats, arranging the day, month and year in whatever order you want and suits your preferences. 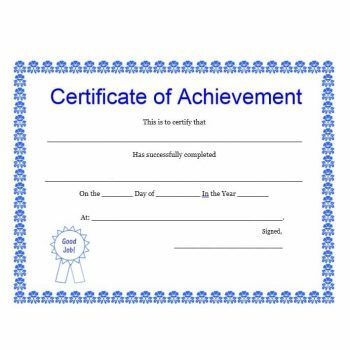 A certificate will not be considered official unless it has been signed by someone in authority. In the case of schools, the signatory is usually the principal or the head of the department. 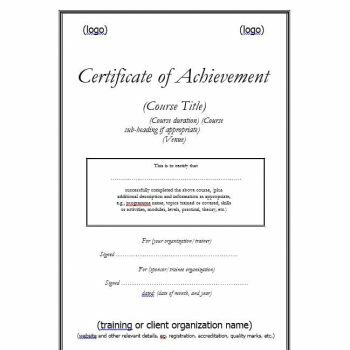 In the professional setting, it is usually signed by the director, manager or immediate supervisor of the employee.It is also very important to include the logo of your company or school in formatting or designing your template. 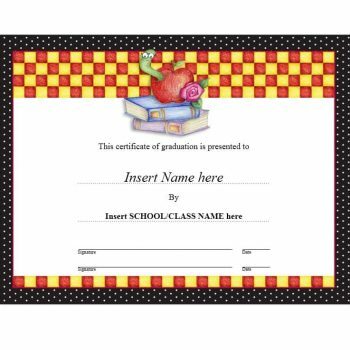 Having your logo will make your certificate legitimate and it would be proof that it had been given by your school administration or office. 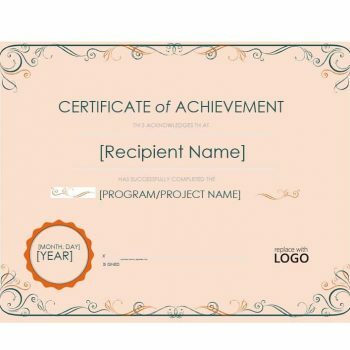 You can place your logo on the left side of the certificate but normally, it is usually placed in the center to give a good flow to the whole format.Be guided by these procedures and make sure to include all these sections in your certificate template so that it will not only be official but comprehensive as well. It will be easier for you if you are using Microsoft Power Point. 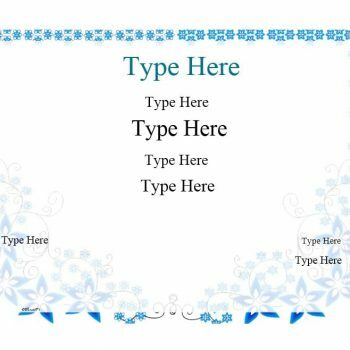 In creating your template, you do not only need to know the texts which are required to be included but it would also be helpful to learn formatting tips for it. 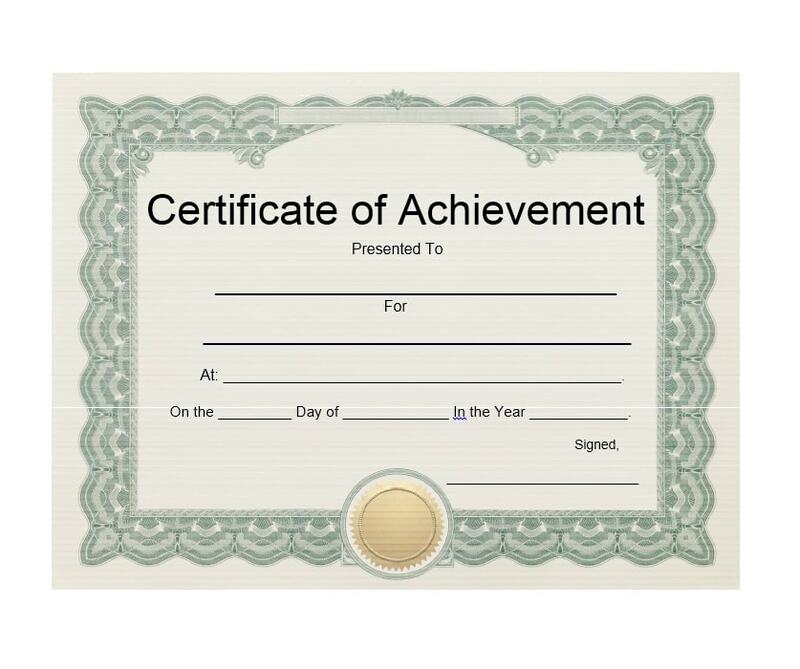 Having a well-formatted certificate template would make it look more formal and much as an actual certificate. 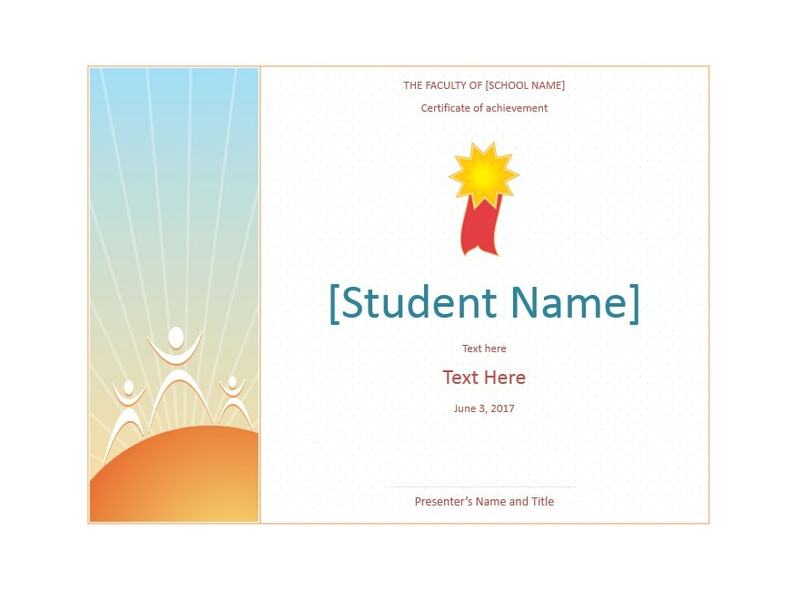 You can make your own template from scratch or you have the option to download a blank template from the different resources online. 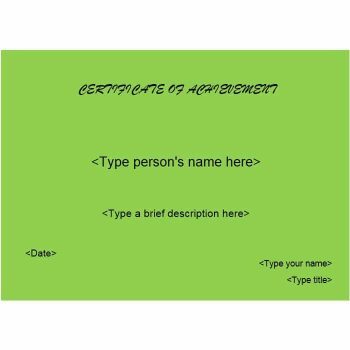 In the process of making your own certificate template, you require the normal letter-sized paper size then set margins for it. If you plan to download your template, they usually come in this size too. 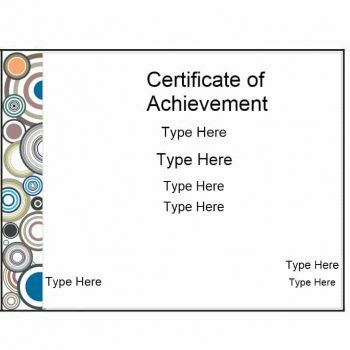 Use a landscape format when designing your certificate template since certificates are more often printed horizontally rather than vertically. 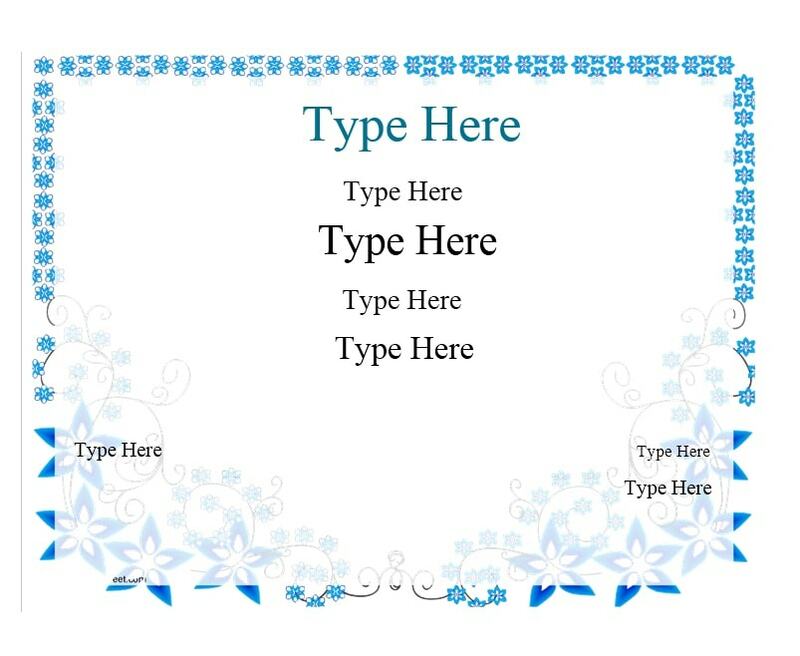 Set your margins and place a border of your choice. 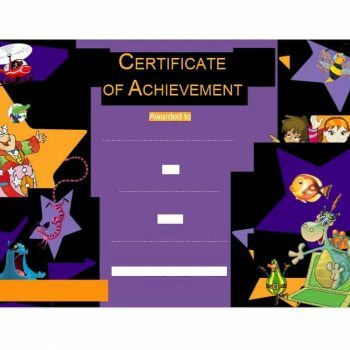 Formal borders are best for certificates that have sources from offices, companies or organizations while colorful, whimsical borders can be used for certificates coming from schools. Some software are designed in a way that they come with border graphics but you can also find a lot of options online. 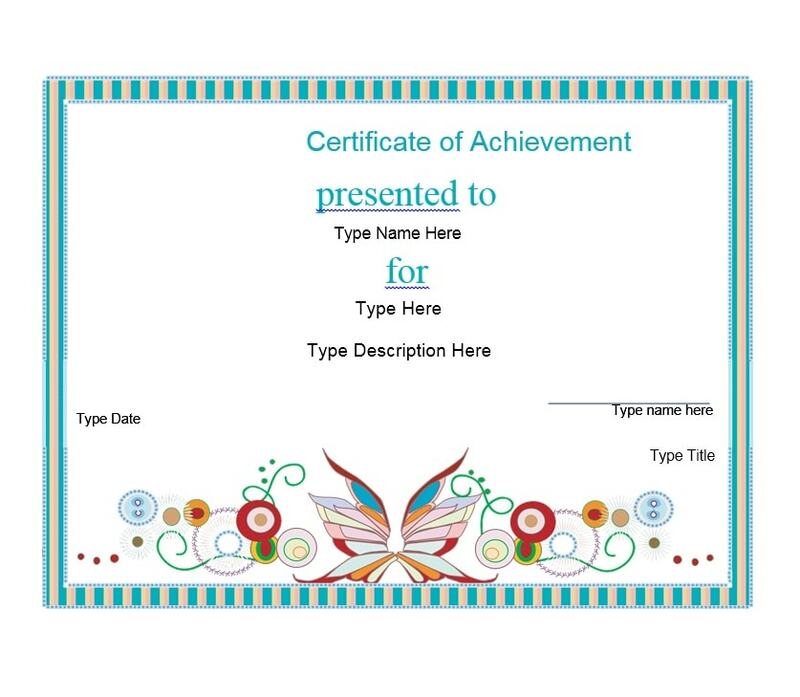 Once you’ve chosen your border, resize it to frame your certificate well. 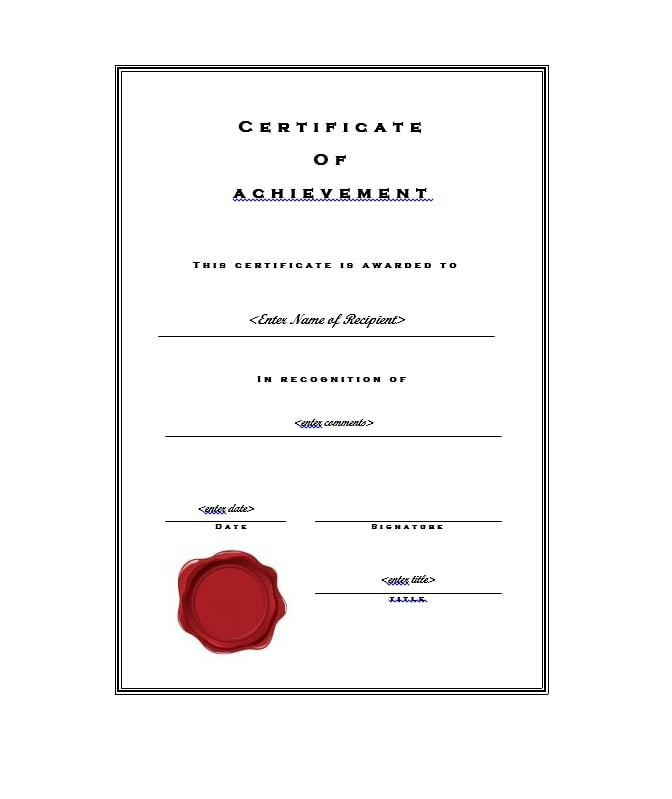 Make sure you have enough space to accommodate all the text you need to write on your certificate. Also, take note that you can only use colorful borders if you are able to print them that way. If you do not have a color printer, choose borders which would look good even without color. To make things simpler and easier for you to edit, arrange the border at the very bottom of the page so that you can type your text over it. 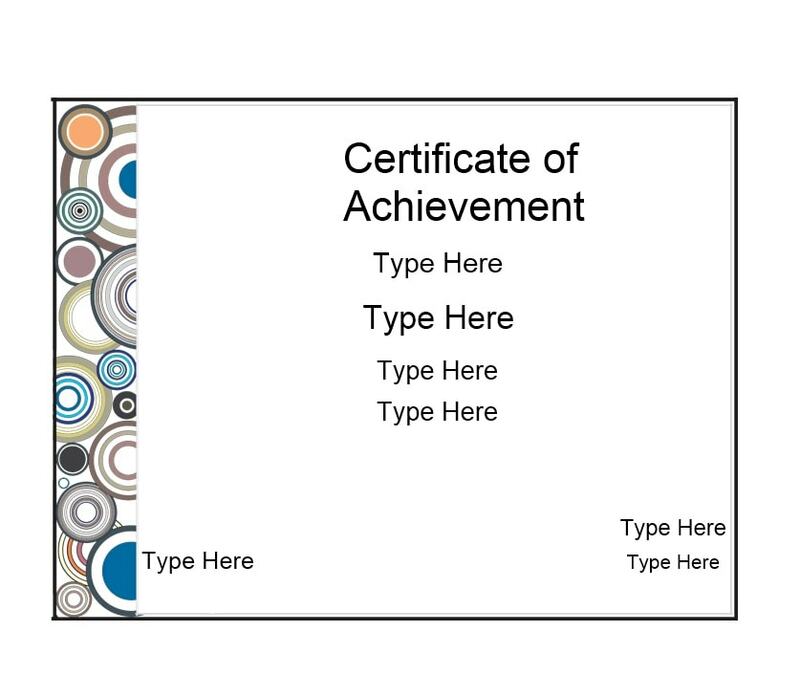 Customize your certificate template. 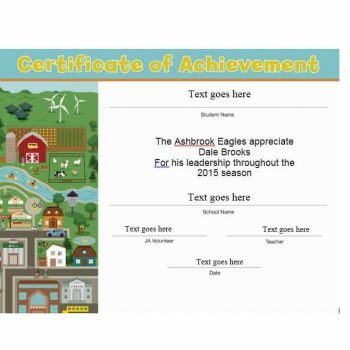 Add all the lines of text and fill in the information you need to complete it. You also have the option to add pictures or graphics to liven it up. 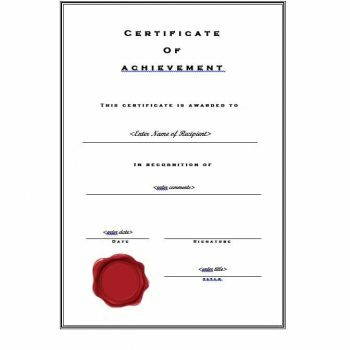 Before you decide on printing your certificate, you must, first of all, proofread it carefully in order to correct any errors. 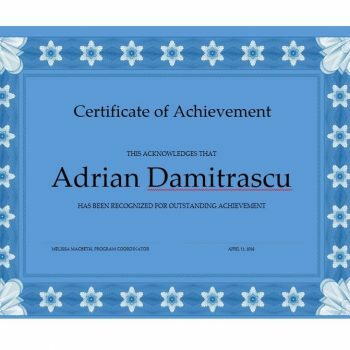 This is the moment which you must ensure that every detail in the certificate is properly placed and it looks perfectly good with an appealing presentation. 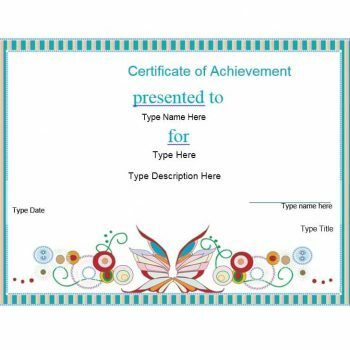 If you decide to print your certificate on a preprinted certificate paper, you are supposed to pass it into the printer and print a single copy in order to verify the placement of within the borders. 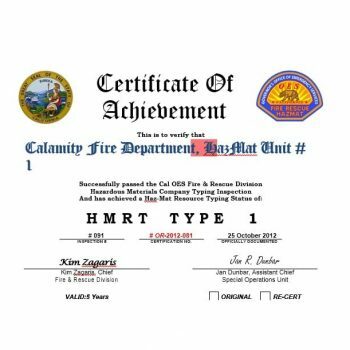 Edit where necessary and print the final copy of your certificate.